Waste Management, Inc. of Florida services the homeowners of Indigo East with curbside garbage and recycling. Days of garbage service to be Tuesdays and Fridays of each week. *Please place standard size (55-gallon) trash container at the curbside no earlier than 7 PM the evening before pickup and remove empty container by 4 PM day of pickup. Waste Management will not have a scheduled pick up on a national holiday. Should the holiday fall on a Tuesday, the next pick up will be Friday, and if it falls on Friday, the next pick up will be the following Tuesday. Days of recycling service to be Thursday of every week. (Recycling container is available at Customer Service) Containers will need to be placed curbside no earlier than 7 PM the evening before pickup and please remove empty container by 4 PM day of pickup. Simply put, recycling made easy! Many materials can be recycled and everything goes into one bin! No sorting required! Recycling that is truly hassle free! 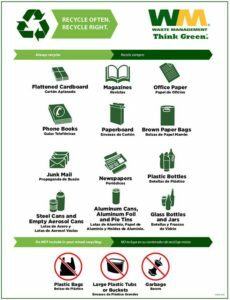 Just use your same recycle bins and recycle the items below! No aluminum foil, paint cans, or scrap metal please. No aerosol cans unless empty. Water, soda and milk with the numbers 1 thru 7. Look for the number on the bottom of the container. Please rinse all containers and remove and dispose of caps. Please place yard debris off the curb early in the morning of, or the night before, your scheduled day for pick-up. Please place yard debris away from storm drains. We ask that no household garbage or animal feces be placed in with the yard debris. * Subject to change based on inclement weather. ** Due to volumes, pickup may extend into Tuesday. © 2018 On Top of the World Communities, Inc.